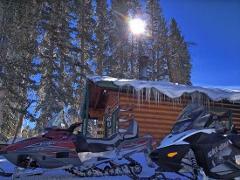 Enjoy first tracks on our morning snowmobile ride. 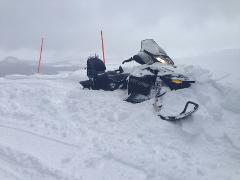 On "powder days" you will be the first to experience the trails through the fresh snow. Ride on Rabbit Ears Pass over the Continental Divide. Your tour will take you through beautiful tree-lined trails and offer you the opportunity for free time in the big open meadows. This ride is perfect for all experience levels. 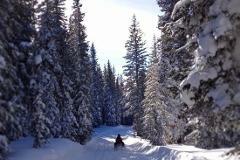 This half day experience will let you ride on the Continental Divide through the trees and play in the open meadows. Lunch is included. This ride is perfect for all experience levels. 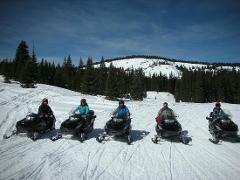 This full day experience will let you ride on the Continental Divide through the trees and play in the open meadows. Lunch is included. This ride is perfect for the more experienced motorized enthusiasts. Ride into the Rocky Mountain sunset in the middle of the National Forest. Amazing scenery awaits you on this sunset ride with dinner at our cabin afterwards. Experience the beauty of the National Forest at night. 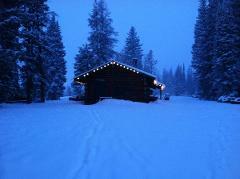 The light from your snowmobile will illuminate the snow capped trees and provide you with a unique adventure. After your ride dinner is served back at our cabin.